This is a cartoon done for a new CLAW 'Zine! This one is all about giving classic monsters the "Twilight" treatment. 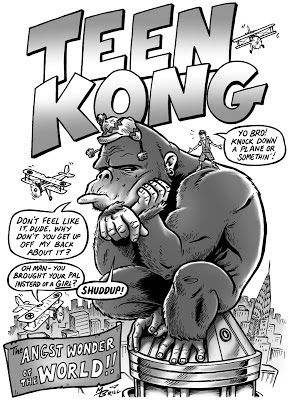 I thought, King Kong as a broody teenager...hmmmm. I picked Kong on the spur of the moment. Another thing we were supposed to add was to have the character doing something against the "rules" that are established for that character to follow. I thought about making him gay and having him carry a guy up instead of Fay Ray...but that seemed too cliche in and of of itself, so I decided that he would drag a friend up with him because he'd be too shy to bring a girl. Maybe he's still trying to sort out his sexuality. ;) I didn't NOT make him gay... Like so many teens, he isn't sure about what he wants--and he's grumpy about it! I added a second page to the "Twilight" inspired 'Zine, because we had one cartoonist drop out. This time I did a sequential art page, rather than just a movie-poster style piece. Love it! This is really funny! Good Job!